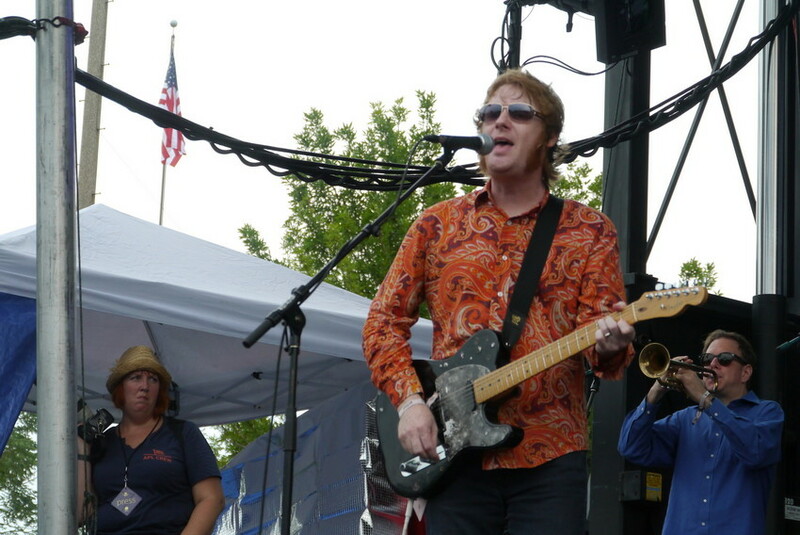 Bill Doss performs with Olivia Tremor Control at the 2012 Pitchfork Music Festival in Chicago's Union Park. Of the three hugely influential Elephant 6 bands that first came together in in the mid-’90s, Neutral Milk Hotel was and remains the most brilliant, and Apples in Stereo the most tuneful. But Olivia Tremor Control, in the person of its two main men Bill Doss and William Cullen Hart, always were the most ambitious. That was true in 1996, and it still seemed to be the case when the reunited band performed at the Pitchfork Music Festival a few weeks ago. Yesterday, the Olivia Tremor Control Web site announced that Doss had died at the age of 43: “We are devastated by the loss of our brother Bill Doss. We are at a loss for words.” No cause was given, but a report in the Banner-Herald of Athens, Georgia, where the band had long ago relocated, notes that, “No evidence of foul play or suicide is evident and Doss had no history of medical problems, [Athens-Clarke County coroner Sonny] Wilson said. An autopsy was performed Tuesday at the Georgia Bureau of Investigation State Crime Lab in Atlanta, but no immediate results were available. “It’s going to be one of those cases that could take three to four months with all the tests they have to run,” Wilson said. For my money, the band’s debut album Dusk in Cubist Castle remains its masterpiece, but neither Doss nor his partner ever played a bum note, and Doss’s post-Olivia Tremor Control work with the Sunshine Fix was nearly as good as everything he did with his better-known band. To pay tribute to this unique and visionary musician, here are two pieces I wrote about his first band back in the day, the first a brief profile of Olivia Tremor Control for Option magazine in 1996, with a brief addition from a later interview with the musician, and the second a broader piece on the group and its Elephant 6 cohorts that I wrote for the Minneapolis weekly City Pages that same year. Billed as “music from an unrealized film script,” Dusk at Cubist Castle, the stunning debut by the Olivia Tremor Control, is that rarest of rarities on the ’90s rock landscape: a concept album. Exactly what the concept is is hard to say; it has something to do with two women named Olivia and Jacqueline 1906 and a big earthquake called the California Demise, but the story is harder to follow than The Lamb Lies Down on Broadway. It doesn’t really matter. The collection of 27 tunes (plus bonus ambient disc) is a rewarding and wonderfully inventive soundscape that incorporates elements of krautrock, Revolver-style psychedelic pop, Pink Floyd space jams, and Byrdsy harmonies, and its two auteurs are the first to admit that the mystery is part of the fun. Currently based in that hippie haven of Athens, Georgia—and augmented by the rhythm section of Eric Harris and John Fernandes—Hart and Doss have been making music together since they were both in high school in Ruston, Louisiana, a small town about six hours north of New Orleans. Ruston is distinguished only by the presence of Louisiana Tech University, and it was at the engineering school’s small radio station that Hart, Doss and a group of their friends got their musical education as volunteer DJs. Dubbed the Elephant 6 collective by Hart, the circle also included Robert Schneider of the Apples In Stereo (since relocated to Denver) and Jeff Mangum of Neutral Milk Hotel (now based in New York). Armed with four-track cassette decks, these friends were constantly trying to impress and outdo each other with the sounds they made in their parents basements. If Ruston, Louisiana, isn’t officially the middle of nowhere, it’s the first exit before it. Five or six hours north of New Orleans, the only reason Ruston even made my AAA guidebook is because it’s home to Louisiana Tech University—an engineering school, not exactly an artistic hotbed or a center of cultural thought. But Louisiana Tech has a college radio station, and wherever there’s a college radio station, there’s a group of curious music fans plotting to take over. Jeff Mangum, Robert Schneider, William Cullen Hart, and Bill Doss started infiltrating Louisiana Tech’s radio station as volunteer DJs when they were all still in high school. (I don’t believe any of them ever bothered to actually enroll in the college.) There they had access to all the hippest indie rock—Guided By Voices and Pavement and Sebadoh—but they also discovered Krautrock, the trippy sounds of ‘70s German art-rock bands like Neu! and Amon Düül II, Brian Eno’s pop efforts, and albums such as Revolver, Pet Sounds, and The Piper at the Gates of Dawn, relics of the first era of psychedelic rock and shining testaments to what can be accomplished in the recording studio when folks are fueled by the potent drug of rampant imagination. The Ruston boys started making music themselves in various combinations in various parents’ basements and garages. They traded four-track cassettes with each other and—with a teenage sense of drama amplified in those who live one exit before the middle of nowhere—they marked all of their recordings as products of something called “the Elephant 6 Recording Company.” They had time on their hands to dream up stuff like that, but time passed, the gang split up, and everyone moved out of Ruston. The guerrilla DJs of Louisiana Tech kept making music, though, and now lo and behold, we have three startlingly unique albums from three bands with four auteurs in three different cities—all of them marked somewhere in the fine print as products of Elephant 6. Despite the ties of friendship and history (not to mention the same master record collection down at the station), the full-length debuts by Neutral Milk Hotel (Mangum), the Apples In Stereo (Schneider), and the Olivia Tremor Control (Hart and Doss) are surprisingly diverse except for two general similarities: They are all essentially home recordings, and they are all remarkably ambitious. In the past too many of the leading lights of the four-track movement have been lo-fi as a sort of political statement; bedroom albums don’t have to sound as if they were recorded through the wall from the apartment next door. The Elephant 6’ers could care less about being hip if it means they have to sound like crap. They’re emulating the musical heroes whose fanciful soundscapes transported them out of Ruston via their headphones and late-night radio shows. Schneider offers a clue to his working methods with liner notes that thank Mark Lewisohn, author of The Beatles Recording Sessions, a tome that lovingly details every backwards guitar and tape loop on Revolver and Sergeant Pepper’s Lonely Hearts Club Band (which, after all, were the first really wacky four-track recordings). The aptly titled Fun Trick Noisemaker is the slickest and most consistent of the Elephant 6 albums, and Schneider seems to be the master technician of the crowd. He is also the least interested in visual wordplay. From their new home in Denver, the Apples In Stereo play fairly conventional songs of love and loneliness (“Love You Alice/D,” “Pine Away”), with a sprinkling of science-fiction fun thrown in. (“Step inside the rocket ride / You’re leaving on a race through outer space,” Schneider sings with childlike enthusiasm in the giddy “Dots 1-2-3” as drummer Hilarie Sidney, the most prominent female voice in the collective, provides gorgeous backing vocals.) Like the fabulous Flaming Lips, the Apples contort their old-fashioned pop songs into something new and different by injecting weird synthesizer sounds and odd vocal effects, or contrasting chaotic guitar noise with crisp, jangling acoustic guitars. It’s a heady and winning mix. Best of all is the Olivia Tremor Control’s Dusk at Cubist Castle, a debut double album plus bonus ambient disc. In the manner of Eno’s Music for Films, Dusk at Cubist Castle consists of songs that Hart and Doss conceived for a movie that doesn’t exist; it’s billed as “music from the unrealized film script.” But the album creates plenty of pictures on its own. Now residents of Athens, Georgia (once home to some monsters of rock who haven’t made music this inventive since Murmur), Hart and Doss offer up a ridiculously generous twenty-seven tracks, not counting the extra ambient cuts. They visit landscapes ranging from the fanciful and sweetly nostalgic town of a child’s imagination—as on Pet Sounds-styled pop songs such as “No Growing (Exegesis)” and “Courtyard”—to the icy Antarctic and the dark side of the moon (as on the creepily static and mostly untitled instrumentals). Like all of the Elephant 6 efforts, it’s a trip you shouldn’t miss taking if you’re at all interested in rock music that uses the studio as a portal to brave new worlds. That the studio can be just a four-track cassette deck in a place like Ruston is the sort of thing that gives me the faith to keep listening, even in the age of Hootie and the Macarena.